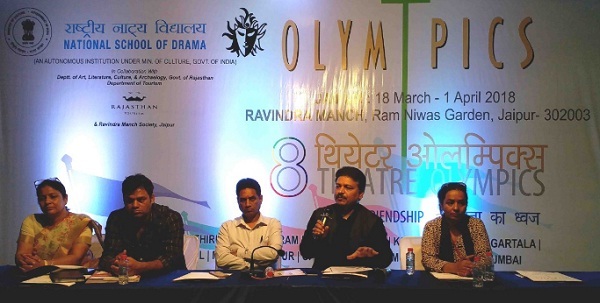 Jaipur : The Pick city is all set to grab the limelight as one of the co-hosts of the 8th Theatre Olympics, the largest international theatre festival held for the first time in India. The Jaipur chapter of Theatre Olympics 2018 is organised by the National School of Drama under the aegis of Ministry of Culture, Govt. of India in collaboration with Ravindra Manch Society, Art & Culture Department, Government of Rajasthan. The event will be attended by Registrar, National School of Drama (NSD), Pradeep Kumar Mohanty, Laique Hussain and Mamta Mathur, PRO, Ravindra Manch, Jaipur. “The 8th Theatre Olympics is a great opportunity to highlight the cultural heritage of Rajasthan. Many folk forms from the state have already been showcased during the festival. We hope that this international festival will give a boost to the folk and theatre performers,” says Registrar, National School of Drama (NSD), Pradeep Kumar Mohanty. “It is a great privilege for us to be a part of the 8th Theatre Festival and I am sure it will be a great success. Theatre lovers in Jaipur are eager to enjoy the performances. The festival will culminate on 8th April, 2018 at Mumbai,” says Mamta Mathur, PRO, Ravindra Manch, Jaipur. The desert state has a number of indigenous folk and theatrical forms, many of which are popular among the common people such as puppet dance, Kalbelia, Ghoomar, etc. Some of these like Swaang, Gawri, etc. have been showcased during the ongoing theatre festival. The pink city will experience theatrical stellar performances during the Theatre Olympics festival. Jaipur will witness 15 plays over the fortnight that includes 6 specially invited plays as well as folk performances and international productions. The mega event will present folk production “Satya Harishchandra” (Choudhary Chajjan Singh), specially invited plays such as “Bali” (K S Rajendran), “Gokulmirgamana” (B V Karanth), and “Mirza Sahibaan” (G S Channi) and others.